Chad Selman, operator of S & S Pecans, pours a zinc mixture into a sprayer machine on the back of his all-terrain vehicle as his father and company owner, Chuck Selman, waits. The Selmans do most of the work on their farm during the summer and hire temporary visa workers, usually from Mexico, during the fall to help with harvesting pecans. Chad Selman, operator of S & S Pecans, cuts branches from a pecan tree. Selman works with his father, Chuck Selman, during the summer to perform most of the farm work, and then the Selmans hire temporary visa workers during the fall to help with the pecan harvesting. 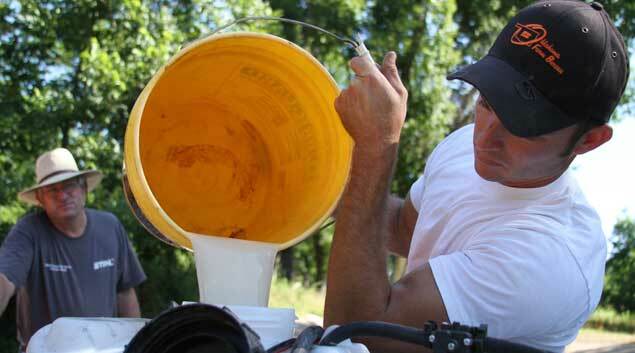 Chad Selman, operator of S & S Pecans, does most of the farm work in the summer with his father. In the fall, the Selmans hire temporary visa workers to help them harvest and care for the thousands of pecan trees they have. It’s cheaper to hire an American. Pecan farmers Chuck Selman and his son Chad want to make it clear that rather than paying thousands of dollars to legally bring a foreign laborer to work on their farm, they would prefer to just hire John or Jane Doe from down the street. But finding legal U.S. residents interested in harvesting pecans in the Tulsa area has never been an easy task. So, in 2007, the Selmans started using a temporary agricultural visa program to hire workers from other countries, legally. The H-2A Temporary Agricultural Labor Certification Program exists in the event there is a shortage of U.S. citizens to perform agricultural labor. The Foreign Labor Certification Data Center reported that, during the 2010 fiscal year, about 49 agricultural companies in Oklahoma were certified to hire 337 foreign laborers through the H-2A program. Nationally, about 56,000 H-2A visas were granted in 2010. However, farmers, program advocates, lawyers and human rights activists have concerns and complaints about the program along with its counterpart, the H-2B visa program for non-agricultural jobs. Critics say not only are both programs burdensome and expensive to use, also they are abused in ways that point to larger issues within the U.S. immigration debate. The Selmans are looking for eight workers but aren’t optimistic that they will find a U.S. citizen to employ. An H-2A employer must continue to hire U.S. citizens who apply for the job until the H-2A workers have finished half of their work contract. The Labor Department, the H-2A certifying entity, does not track how many U.S. legal residents take the jobs advertised, said Joshua Lamont, U.S. Department of Labor spokesman. When the Selmans first used the program in 2007, one U.S. citizen came to their farm and interviewed for the job. Then the ice storm of 2007 came and interrupted harvesting for two years. In 2009, no one responded to newspaper ads seeking workers. Last year, they got four applications. Anyone drawing unemployment from the state of Oklahoma must apply for two jobs per week. If a person receiving benefits is offered a job that he or she could be reasonably expected to do, he or she must take that job, said John Carpenter, the Oklahoma Employment Security Commission public information officer. Carpenter said the commission’s staff audits some claims, and if they discover someone with a fraudulent claim, they can charge that person for the time they were making fake unemployment claims.The staff does not check claims every week because of the large volume of payments. In 2010, the number ranged from 53,000 to 78,000 unemployment payments granted per week. In 2010, the Oklahoma Employment Security Commission found 4,731 unemployment benefit overpayments totaling $3,345,640. So far, the commission has collected $1,832,959 in reimbursements from claimants. David North, a Center for Immigration Studies fellow, remembers a temporary work program that came long before the H-2A program. North, who blogs for the conservative group that favors tighter restrictions on immigration, worked for the Labor Department in the 1960s during one of the first guest worker programs, the Bracero Program. Started in the 1940s during WWII, the Bracero Program brought Mexican laborers to the U.S. to perform farm work. It ended in the 1960s. The idea that farmers cannot find U.S. citizens to perform agricultural labor is not a new complaint. The H-2A program exploits foreign workers and potentially displaces American workers, he said. North said if American farmers paid more, U.S. citizens might be more willing to do the work. Workers in the H-2A programs are paid whatever the highest wage is out either the Adverse Effect Wage Rate, which is the minimum wage the Department of Labor determines for agricultural workers; the prevailing wage for the position they’re filling; or the federal or state minimum wage. Of the jobs reported through the Foreign Labor Certification Data Center, about half of the H-2A positions in Oklahoma last year paid between $9 an hour and $10 an hour. All of the positions paid at least $7.25 an hour but no more than $12 an hour, according to the center’s data. Additionally, the guest workers in the H-2 programs are likely more docile and less troublesome than American workers, North said. For one, the workers are indentured to the employer and thus are counted on to show up because they have no other options. Secondly, the workers can’t join a union or go on strike or leave their jobs to stay in the country legally. Mark Elam, Oklahomans Against the Trafficking of Humans coalition director, said even though one might think that the H-2A workers are less likely to be exploited than illegal immigrants, that’s not the case. Elam said he also worries about the number of government employees who work to hold employers accountable. “If you’ve been doing it for years and you’re a person without morals or ethics to some degree, and nobody ever comes and checks on you, no one ever comes and checks your books, and no one ever asks you if what you’re doing is right, the possibility to exploit those workers becomes very real,” Elam said. Another problem with the H-2A programs involves the recruiting process as some H-2A workers learn about the programs through a recruiter in their country. Trusting recruiters not to exploit workers was enough of a concern for Oklahoma City immigration attorney Doug Stump that he no longer has a large number of H-2 clients. The program itself is not corrupt, but some of the people who use it are, Stump said. Stump also said he has stopped processing H-2A paperwork because the program has become too difficult to navigate, overly burdensome and entirely inefficient. Some H-2A program advocates and lawyers say the H-2A programs have become overly complicated because the federal government wants to end the programs. Kay Price, who has worked on both the state side and private side of the H-2 programs, said she has noticed a change in the enforcement of U.S. Department of Labor regulations. Chuck Selman started his pecan farm 30 years ago. To harvest the 500,000 pounds of pecans they expect to produce this year, the Selmans will likely bring eight foreign laborers from Mexico to their farm in Skiatook. Through the H-2A program, the Selmans will pay for transportation, food and housing. They will also pay a third party, an H-2A agent, a few thousand dollars to process their paperwork and ensure they checked all the right boxes. And they will pay to advertise for the openings that they’re skeptical they will fill with American workers. As expensive and complicated as it is, the H-2A program is the only legal outlet the Selmans say they have, but Chuck Selman said he knows the frustrations associated with the program tempt some farmers to take a different path. “I did have a farmer the other day say for the cost of getting the jobs done and doing all of this, they were just hiring ones who had papers and might be legal, might not be legal, because the fines for that probably weren’t as bad as the fines [through the program],” Selman said. More than half of the agricultural workers in the U.S. are illegal immigrants, according to the U.S. Department of Labor. Meanwhile, the Pew Hispanic Center estimates that of the 1.8 million people in Oklahoma’s work force, 55,000 are illegal immigrants. Stump said one solution for the agricultural industry is AgJOBS, a federal program that would provide illegal immigrants, their spouses and minor children temporary resident status and lawful permanent resident status upon the fulfillment of specified agricultural work and residency requirements, according to the bill’s summary. One of the senators who introduced the bill, Sen. Dianne Feinstein, D-California, said on her website that to qualify for the benefits of the AgJOBS Act, illegal immigrants working in the agricultural industry would have to pay a fine, show they are current on their taxes, have no criminal record and commit to working in U.S. agriculture for the next five years. “That’s a central element of immigration reform in this country today,” Stump said. “It’s a win-win for everybody. We’ve got to fix the broken system. It’s in our nation’s national security interest to know who’s working in food production, right? No doubt about that. And to have an effective means of monitoring these workers, and AGJobs would provide an opportunity for U.S. workers to utilize easier foreign national workers to fill these voids,” Stump said. A different proposal making its way through the U.S. Congress is “The Accountability Through Electronic Verification Act,” which Sen. Tom Coburn, R-Okla, is a co-sponsor of. The bill, among other things, would require all employers to use the E-Verify system, an Internet-based system that employers use to determine whether employees are eligible to work in the U.S. Mike Spradling, Oklahoma Farm Bureau president, said his organization supports using the agricultural industry using the E-Verify system, but that’s a not a longterm solution. “What we really need in this country is a workable immigration law so that we [farmers] don’t have to end up being the policemen of the immigration system,” Spradling said.